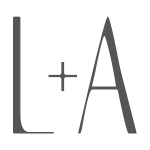 I attempted to keep a secret from my husband this past week…and failed. It’s not my modus operandi but I wanted to preserve my reputation as a decent homemaker. 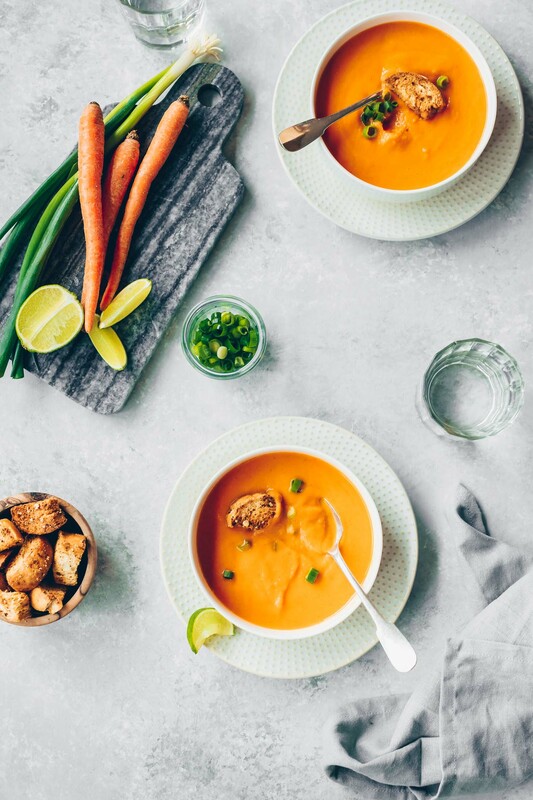 In a moment of laziness last weekend I dumped leftover vegetable soup down the disposal, about 2 cups worth–a big no no around here. We have a 60-year old house and we do what we can to keep things running smoothly. Besides, we have a plumber friend who said that no one should do that in the first place. Ever flexible and taking the words “make yourself at home” seriously, our friends are free to do what they wish here…except for dumping food in the sink. I always make sure that visiting friends and family don’t do it, as helpful as they try to be by helping us clean up. So when the drain slowed this week all I wanted to do was kick myself for breaking my own rule. Normally I would have run right to my husband but he’s been so busy working lately that I didn’t want to add to his already-long list. I even planned to fess up. Instead, when he noticed that the drain was slow I quickly volunteered to bring in a plumber and assured him that I’d take care of it all. Might I add that I have such a guilty conscience that I lost sleep over my omission of the truth? Long story short, the plumber came–I confessed to him what I did because I wanted to make sure he knew what caused the back up–all the while grateful that my husband wasn’t home to hear the truth. Oddly enough, he tested the drain and he deemed it to be working fine considering the cause. So he said that the problem wasn’t the food I dumped in the disposal. Really? He went outside and “snaked” the pipe only to discover sand on the tip of the metal auger. He told me that he suspected a break in the pipe because the snake couldn’t go past a certain point. He decided to run the snake a second time before concluding that we indeed have a broken pipe and before suggesting that the only way to fix it would be to tear up our limestone floor to fix it. As soon as I heard him rat me out my heart stopped beating; never mind that he said my actions didn’t cause the problem. At least the truth was out and thankfully, my husband didn’t seem be bothered at all by the food down the drain. We have a bigger problem now. The technician’s assessment confirmed my husband’s suspicion that something was wrong under the house when he felt a warm spot under the kitchen floor recently. It looks like the warm water from the dishwater is seeping under the floor where the technician suspects the break in the pipe. So until the problem gets resolved (my husband thinks there’s a way around tearing up our floor, thankfully) the dishwasher and kitchen sink will be out of commission. The dishes will have to be done in the basin in the laundry room. It’s not a huge inconvenience but now it’s a race against time to get this problem fixed as we’ll be hosting Thanksgiving again this year. And though I generally don’t mind hand washing dishes, there’s a lot to be said for the convenience of the dishwasher. I suppose the good thing to come out of this was that this episode alerted us of our plumbing problem before it got worse. One thing I definitely don’t mind doing by hand? Fresh pasta. Kneading the dough and feeling the transformation of the flour and eggs in my hands is a pleasant experience for me. 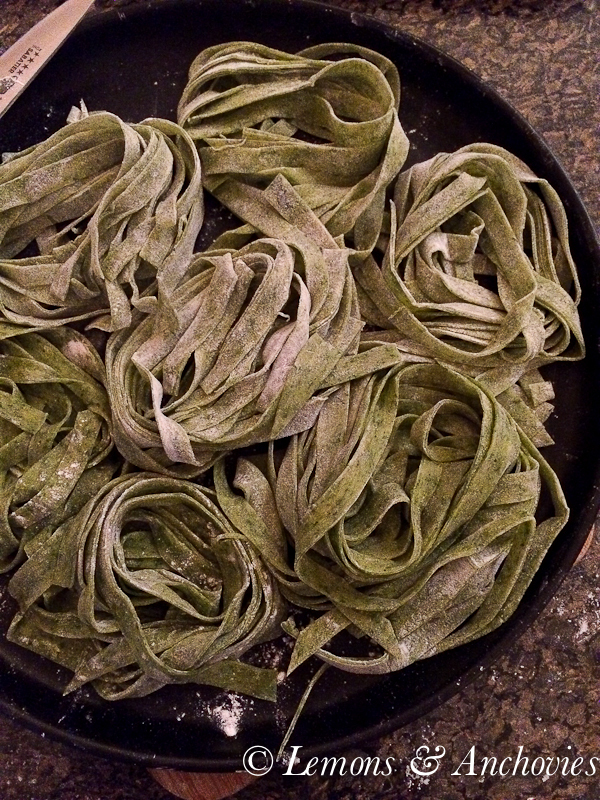 This time I decided to make spinach pasta, a variation on the classic I have long wanted to try. The results were marvelous. 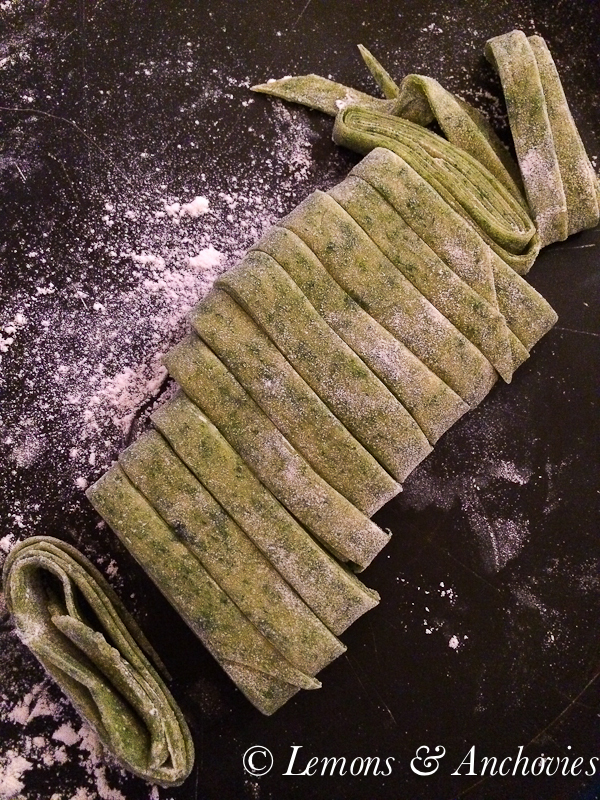 The pasta dough took on a soft green hue and the flecks of chopped spinach made for very pretty sheets of pasta. I continued with the green theme and opted for a simple pesto sauce to finish the dish. 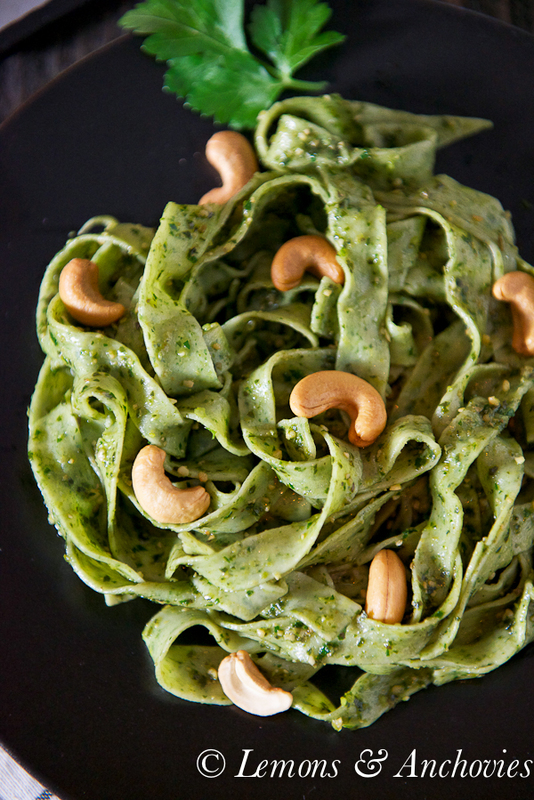 Rather than using my go-to recipe, I added parsley to the basil and substituted cashews for my usual pistachio and pine nuts. There wasn’t a big difference in flavor between the two versions but it’s good to know that the substitutions wouldn’t compromise the quality of a good pesto. Fresh was the dominant flavor here and I couldn’t be happier. 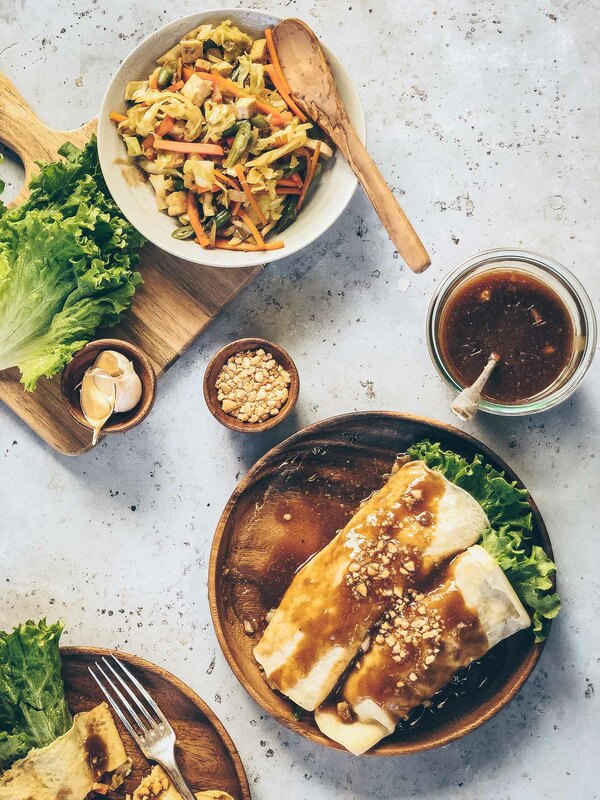 Eating green never tasted so good but if you feel the need to add a bit more to your pasta, shrimp or chicken would be great additions to this dish. Now speaking of dishes…who wants to help? 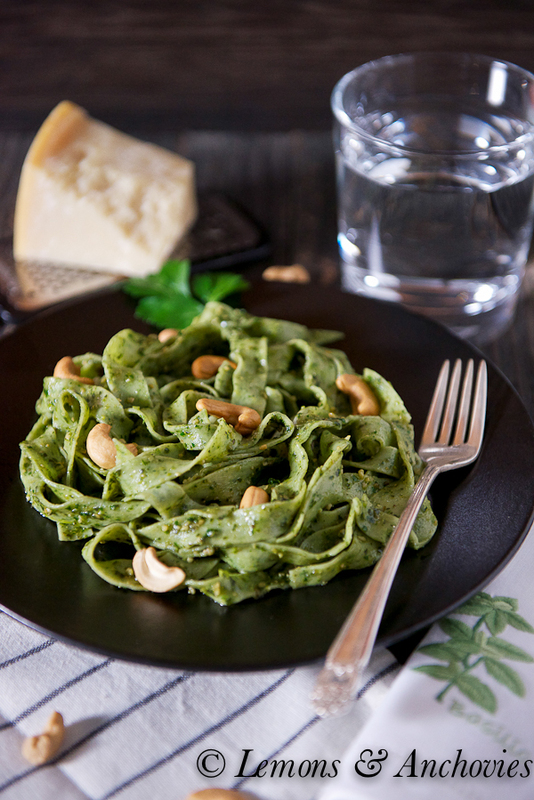 Homemade spinach pasta combined with basil-parsley pesto is green eating at its tastiest. ½ - ⅔ cup roasted, unsalted cashews, dry toasted in a pan for 2 – 3 minutes on medium heat until fragrant. To prepare the pasta, first cook the spinach. Bring a small amount of water to boil in a small pan and add the frozen spinach (I use the loose pack in bags). Cook for just 3-4 minutes then drain the water and squeeze out as much liquid as you can from the spinach. You should have about two tablespoons. You can chop the spinach further but I found this to be unnecessary. Crack the eggs into a bowl and add the spinach (after it's cooled a bit). Beat with a fork until combined. 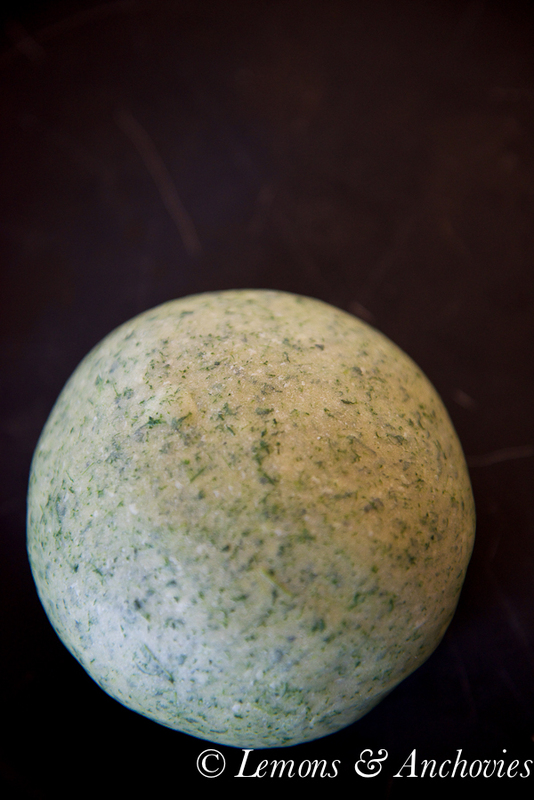 Pour the flour on a clean work surface, create a well in the middle and add the egg/spinach mixture. Start whisking the mixture with a fork, taking in flour a little at a time. Continue to do this until you’ve incorporated enough flour into the eggs so the mixture isn’t runny anymore. Before incorporating the rest of the flour, set a bit aside, maybe a few tablespoons to ¼ cup. Mix the rest of the flour (minus what you just set aside) into the egg mixture using your hands. If the dough seems too wet, add the rest of the flour you set aside. Form the dough into a ball and knead by pulling one end of the dough toward you then with the heel of your hand, push it away. Perform this motion twice then rotate the dough 45° and repeat. Keep doing this until the dough is smooth, about 3-5 minutes is good. Wrap the dough in plastic wrap and let it rest for about 30 minutes before rolling and cutting. To roll and cut, follow the instructions on your pasta machine. Note: I found that the residual moisture from spinach required me to use a bit more of the flour I set aside than for a classic egg pasta. I also had to dust the dough pieces with flour before rolling them out in the machine and before cutting them. You can cut using a pasta machine or cut them by hand like I've done here. To cook, bring a pot of water to a boil, add salt and cook the pasta for 3-4 minutes or until they float to the top. Drain and set aside. To prepare the pesto: put all the ingredients, except the cheese and lemon juice, in a food processor and process until just a little chunky. 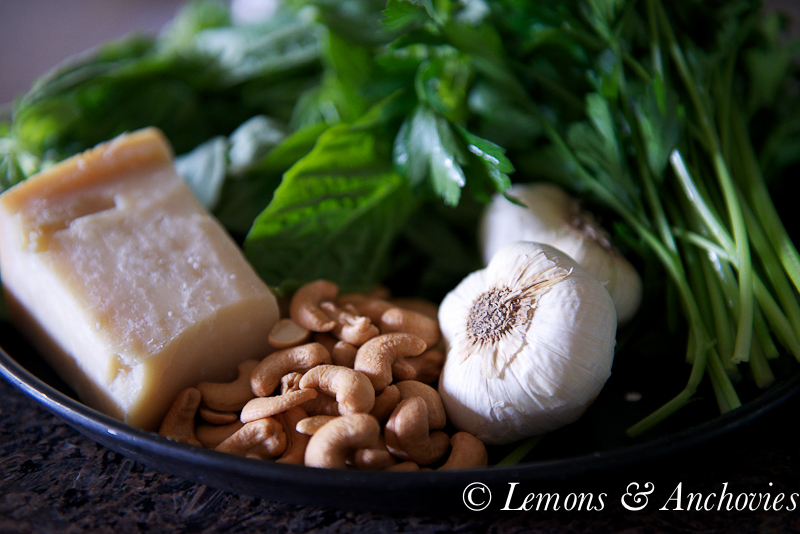 Transfer the pesto into a bowl and stir in the parmigiano and lemon juice. Add salt to taste. Stir into the spinach pasta (you will have more pesto than you need for the roughly 1 pound of pasta in this recipe). Plate and serve. I like to drizzle with a little extra olive oil, top with more cashews and Parmigiano-Reggiano. Ugh. Plumbing problems. We’ve already spent a few hundred dollars this month on fixing our pipes! I so related to your story though. There are things I sometimes do that I know my husband would be shocked at (largely because I work so hard to make sure no one else does them!) Thank you for sharing your words and this delicious pasta! LOOKS SO GOOD! Oh my, what an ordeal! Plumbing problems are no fun, I hope things get sorted out quickly! 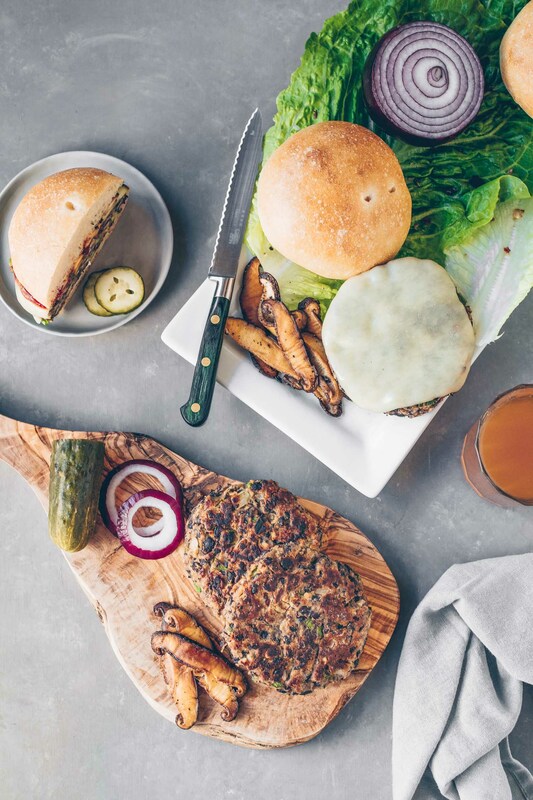 I”ve been waiting for this recipe since I saw your IGs last weekend :). Love both the pasta and pesto! I’d need a dish of this gorgeous pasta and pesto after hauling everything to the laundry room and back. I hope everything gets sorted quickly. That pasta is to die for – so delicious. I loved your story and the subterfuge which got outed. What a pain though. Homemade pasta are so delicious and your dish looks very inviting! Ohhh, water problems can get so serious. Hopefully it will all get fixed soon. Love home made pasta and the pesto, yumm. 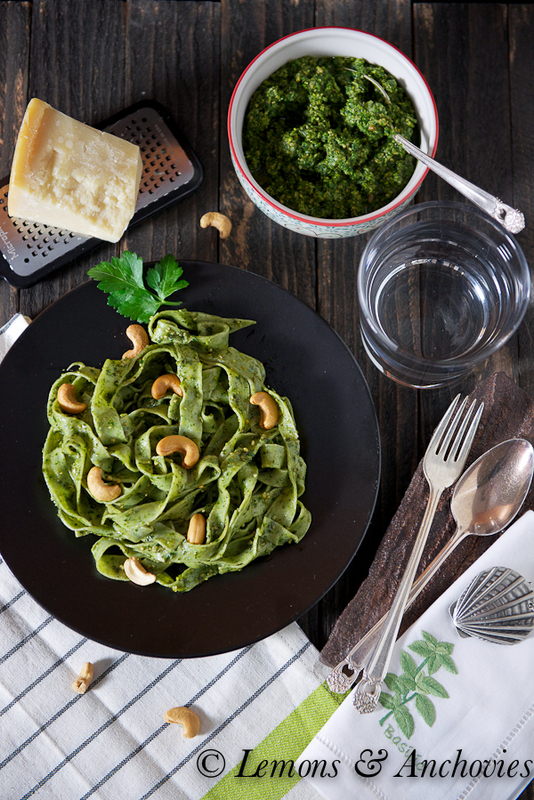 Nothing like fresh pasta and your basil-cashew pesto sounds divine! Oh how I love everything about this homemade pasta. Just had breakfast ~ not I need lunch! This is one beautiful dish! That pesto sounds dreamy.